Ward reveals ten specific failings that are built into our boardroom model and provides real-world fixes to get boards back on track. Ward mixes tart, insightful analogies (what do boards have in common with volunteer fire departments, the U.S. electoral college . . . and Howard Hughes?) with proven nuts-and-bolts advice for putting any board back on track. 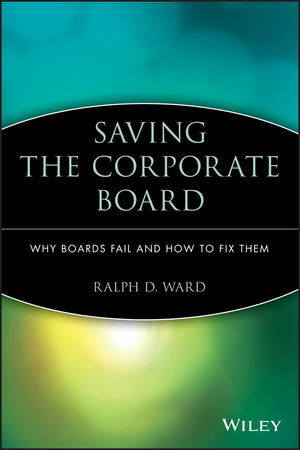 RALPH D. WARD is a nationally recognized writer and commentator on the roles of boards of directors and the future of corporate governance worldwide. He is publisher of Boardroom INSIDER, an online e-mail newsletter of firsthand advice for better boards, and edits the Corporate Board, an international journal of corporate governance. He speaks and consults extensively on boardroom issues in the United States and internationally, and is the author of 21st Century Corporate Board and Improving Corporate Boards, both published by Wiley.